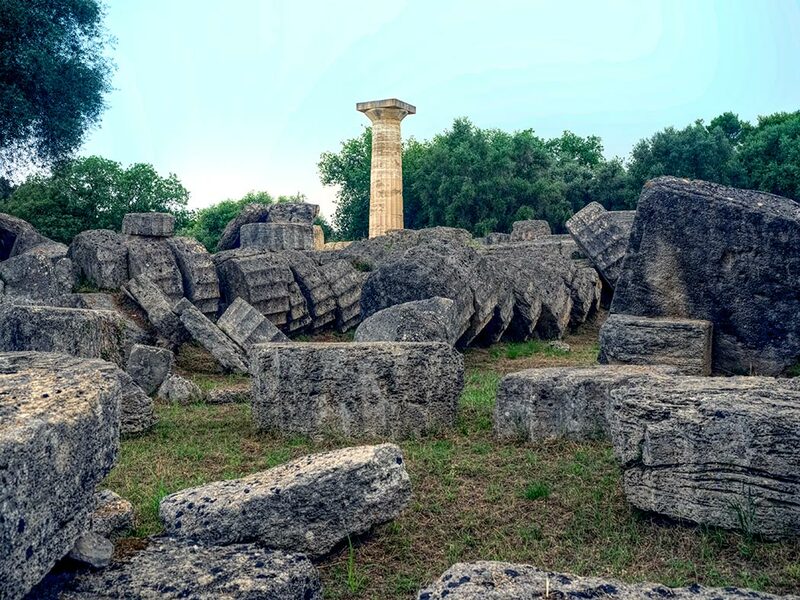 Today the Temple of Zeus stands in ruins, its 34 massive columns toppled and scattered in pieces around the Sanctuary of Ancient Olympia. But in 457 B.C., it was one the ancient world’s great structures. Built to honor the Greek god Zeus, the temple stood 68 feet high and was crowned with sculpted front and rear pediments. The eastern pediment depicted the chariot race between Pelops and Oenomaus while the Western pediment memorialized the battle of Centaurs and Lapiths, with the god Apollo pointing to the Lapiths to show his preference for a human victory. Inside stood a 43-foot high gold and ivory statue of Zeus, one of the Seven Wonders of the Ancient World. The temple stood for nearly 900 years. In A.D. 426, hoping to suppress pagan beliefs and subdue the Greeks, Theodosius II ordered the destruction of the entire sanctuary at Ancient Olympia. Within one hundred years, earthquakes and mud slides had buried most of what remained. The site lay forgotten for the next 13 centuries, until being rediscovered in 1766. By 1875, archeological excavations had begun in earnest, and the recovered pediments were pieced together and permanently put on display at the Archeological Museum of Olympia. I was here in the late 70’s, Barbara, but since I didn’t understand my travel mate’s historical translations…lol….I just enjoyed the trip amongst the runs! So, thank you for your informative article! It really was a remarkable site! Love your photo too! Thanks as always Cris. You always have such kind things to say. Looking forward to seeing you soon! I love this so much! I still remember the first day we studied Greek mythology in my elementary school as a small child, and I completely fell in love with it. Travel to sites like this are my absolute favorite! Someday I definitely have to visit the ruins of the Temple of Zeus! Thanks so much for this post (pinning it to my geeky travel board right now)! I suspect we’re both travel geeks, Jillian. Glad you liked my story, and thanks for your comment. Amazing. I wasn’t aware that archeological excavations were conducted in 1766. Thanks for sharing this. I think in another life I was into archeology! I adore history and all excavations! Thanks for sharing! Hi Mike: Had to laugh – I always said that if I had a chance to do my life over I’d likely be an archeologist or a geologist. Thanks so much for your comment, and for being such a loyal follower. I never knew the Temple of Zeus had so many columns Barbara. 34 is quite impressive. I love envisioning how things were in 400 BC. A handful of structures in Greece, people, then nature. How refreshing. I do this often here in NYC; BC, this place must have been stunning, like virtually every spot on earth. Hi Ryan: It must have been a spectacular structure, especially since it contained the 43-foot high gold and ivory clad sculpture of Zeus, which was one of the Seven Wonders of the Ancient World. Sadly, no remains of the statue have ever been found.